Typical color LCD flat panel monitor on tilt and swivel stand. 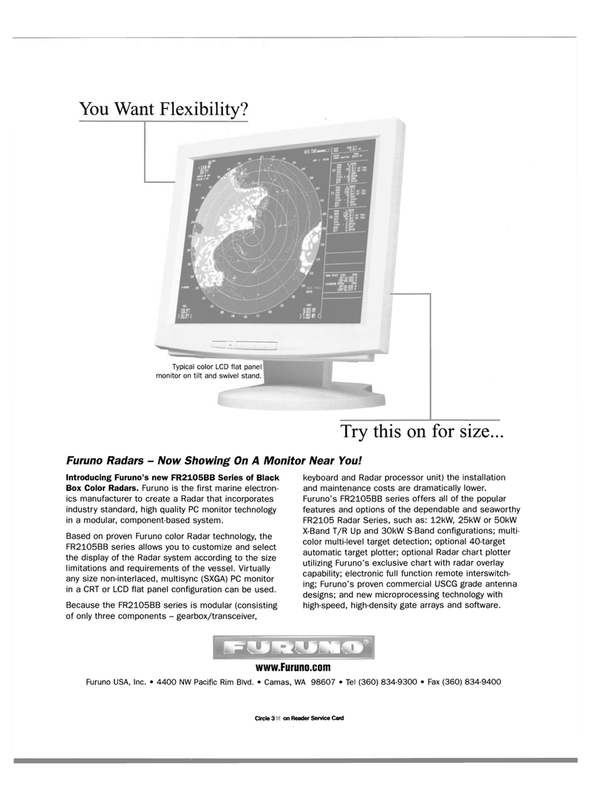 Furuno Radars - Now Showing On A Monitor Near You! Box Color Radars. Furuno is the first marine electron- ics manufacturer to create a Radar that incorporates industry standard, high quality PC monitor technology in a modular, component-based system. FR2105BB series allows you to customize and select the display of the Radar system according to the size limitations and requirements of the vessel. Virtually any size non-interlaced, multisync (SXGA) PC monitor in a CRT or LCD flat panel configuration can be used. Because the FR2105BB series is modular (consisting of only three components - gearbox/transceiver, keyboard and Radar processor unit) the installation and maintenance costs are dramatically lower.